On first glance, the small city of Innsbruck embodies a fiction-perfect Alpine town straight from The Sound of Music—a place of Austrian fantasy where ladies skip down the street in their dirndls and gentlemen in green Lederhosen burst into song after the first handshake. Fairytales are nice, but they are not reality. Yes, there are graceful women in dirndls perpetuating the use of their traditional attire, but it is only after a few minutes conversation that the men may start to sing. Contrary to what its quaint buildings, picturesque location and centuries-old churches may indicate, Innsbruck is a city with a thoroughly modern outlook. Nowadays it’s far more Armani than loden while maintaining a healthy regard for a glorious past as an imperial capital (the only Austrian city besides Vienna able to make such a claim). There is an unmistakably Italian feel about the place—not surprising given the few hours drive to Venice. What does this mean in terms of day-to-day living? The Austrian propensity for efficient organization is paired with Italian vivaciousness and appreciation for la dolce vita. From a traveler’s point of view, this is quite the ideal combination. 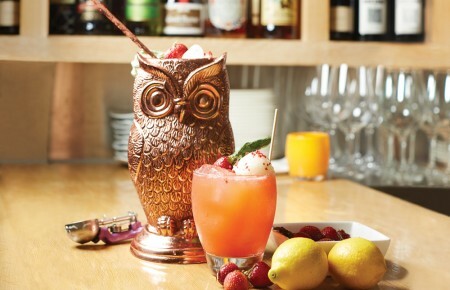 For one thing, cathedrals of fine cuisine have become the new houses of worship for in-the-know food connoisseurs. The food here tastes clean. Local farmers prefer to raise plants and animals the old-fashioned way without chemical intervention. The ingredients used in Innsbruck’s restaurants are intrinsically organic. At Schöneck, masterful chef Alfred Miller greets his customers with the benevolence of a grandfather welcoming his family to a holiday meal. 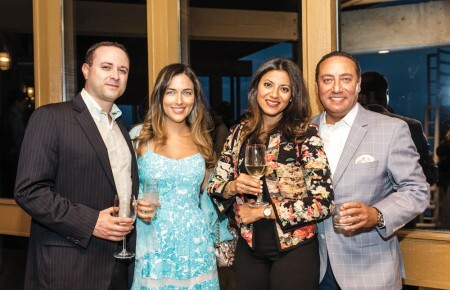 Schöneck is almost unknown to visitors but firmly entrenched among locals as one of their most beloved dining establishments for seasonal dishes and a stellar wine list. Among Innsbruck’s numerous eateries is Sitzwohl, owned and operated by Irmgard Sitzwohl and Elisabeth Geisler, two chefs who have years of experience working in the best establishments in the country. The word at Sitzwohl is inventive. Expect teasing and pleasing of the palate with surprising taste combinations and preparation methods to satisfy the most jaded of culinary connoisseurs. Appropriately for the new Innsbruck, Sitzwohl’s contemporary dining room is located in a grand old school building whose conservative façade belies the restaurant’s modern interior. The fine food complements the pure water sourced far beneath the Alps, naturally filtered through the rocks over thousands of years. As a two-time host of the Winter Olympics (1964 and 1976), the city’s association with snow and winter sports is well deserved. Innsbruck in wintertime is a cold-climate athlete’s delight. Visitors seeking European grandeur on a more intimate scale will be enthralled. The city’s natural setting in a narrow valley with imposing mountain peaks and relaxed locals who smile and laugh with ease impresses even the most blasé traveler. 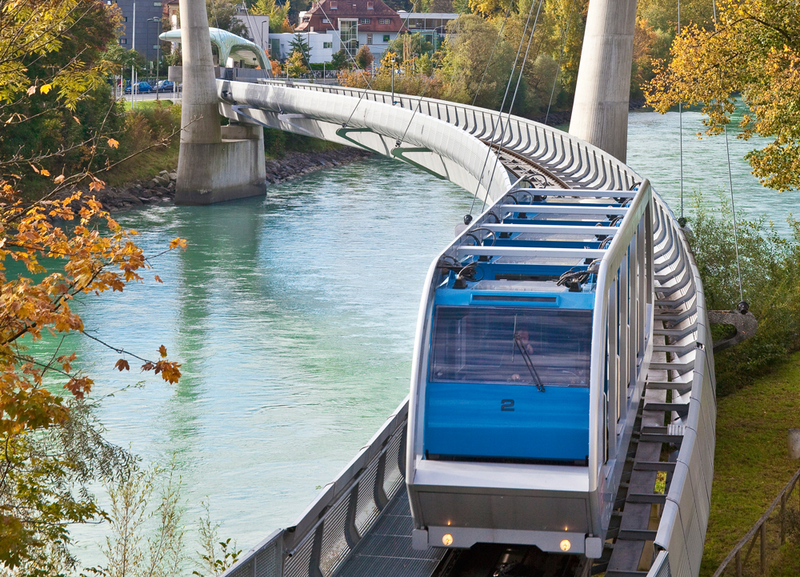 As a ride on the Nordpark Cable Railway aptly attests, there’s futuristic creation in the Innsbruck area. 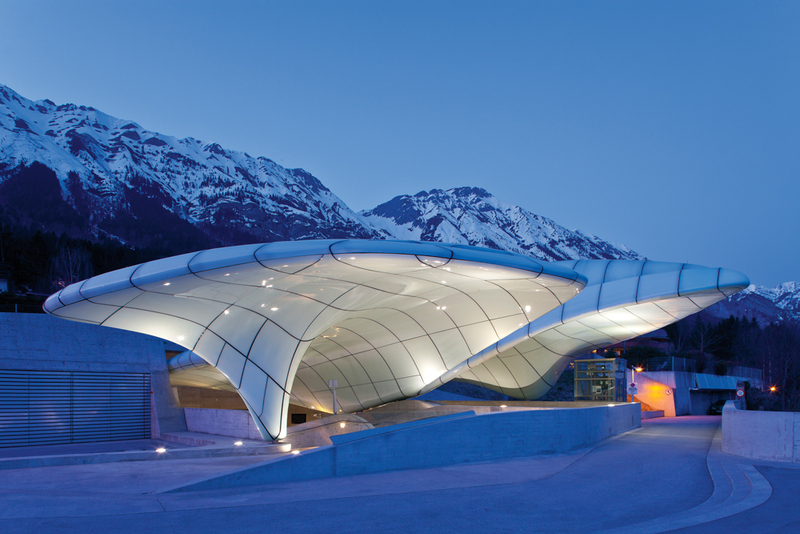 The late celebrated architect Zaha Hadid’s flair for dramatic design is immediately recognizable in her curved crafting of the railway’s four small stations—each a different shape. The stations are reached by cable cars ascending and descending the mountain of Nordkette. A gem of the Alpine wild, its peak rises to 7,400 feet and serves as a popular destination for hikers wanting to breathe the crystal clear mountain air. The Hungerburg station is worth a stop. It’s an excellent vantage for taking in the stupendous views of another of Hadid’s works: the Bergisel Ski Jump. Most cities do not have a ski jump at all, let alone one designed by a Pritzker Prize winner, and its uniqueness bestows an immediately identifiable symbol onto the city. 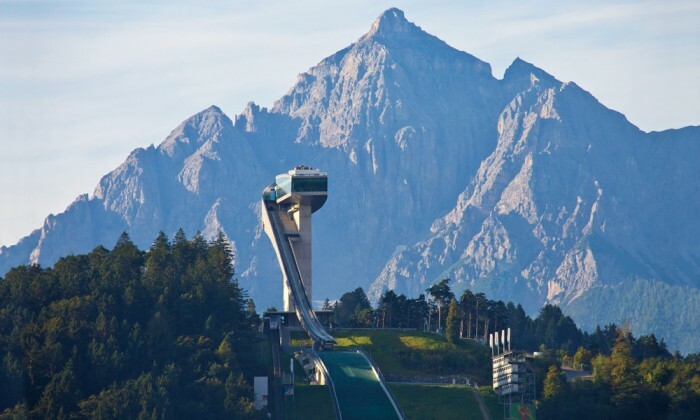 Famed ski areas such as Igls and Seefeld are in close proximity to the city, but the region around Innsbruck also offers some unexpected diversions from the pistes. 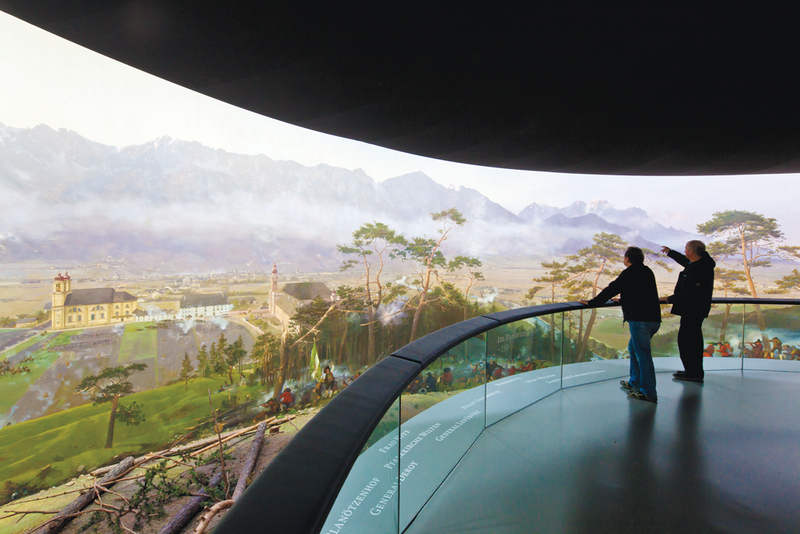 Near Bergisel is an inimitable building constructed for the express purpose of housing a single painting: “Das Tirol Panorama.” The vast work depicts the 1806 battle in which a ragtag company of Tyrolean soldiers defeated Napoleon’s troops. The cylindrical painting—enormous at more than 10,000 square feet—completely encircles the room and is ingeniously illuminated to showcase its grandeur. Down the Bergisel mountain from “Das Tirol Panorama” is the exceptional Wilten Basilica. Home to a painting of the Madonna that is believed to have miraculous powers, it has been a pilgrimage site for centuries—though the basilica’s elaborate, powder-pink Rococo interior is reason enough to venture inside. Once there, be sure to look up to see the exquisitely executed trompe l’oeil ceiling. Innsbruck’s Imperial Palace shines brightly as one of the country’s cultural jewels, seen most dazzlingly in the appropriately named Giant’s Hall, whose dimensions match the décor in grandeur. Not dwelling in its past, the Imperial Palace offers a multitude of cultural programs for residents, keeping their history relevant in contemporary society. The engaging Tyrolean Folk Art Museum is located just across the street. Beyond simple displays of traditional life of centuries past—everything from household utensils to carnival masks—are beautiful rooms from old homes whose wood walls and stately porcelain heating stoves were the ultimate in coziness. Culture vultures will also enjoy a performance at the historic Tiroler Landestheater. The former imperial theater (also across the street from the Imperial Palace) maintains a full calendar of opera, recitals and plays throughout the year. A short walk down is the Ferdinandeum, Innsbruck’s leading museum of contemporary art showcasing rotating exhibitions alongside its permanent collection. On the city’s outskirts, Ambras Castle’s beautiful Spanish Hall is a favorite venue for Innsbruck’s more colourful past. One visit to the Chamber of Art and Curiosities at the castle is enough to demonstrate that Innsbruck was a city ahead of its time—even four centuries ago. The Chamber’s collection of bizarre objects was an avant-garde display in its era and remains just as provocative. After all, wood skeletons and portraits of young girls with beards are just as rare in the 21st century as they were in the 1500s. The curious collection of Archduke Ferdinand II’s objets is certainly eclectic—it’s not every museum that has a portrait of Dracula. One of the most popular tourist attractions in Austria is a family-owned business located in the little village of Wattens, less than 10 miles to the east of Innsbruck. It is here one finds the headquarters of Swarovski Crystal and its marvelous attraction, Kristallwelten, known in English as Crystal Worlds. Visitors can expect a quick tour around a workshop to see how crystals are made before being led to a gift shop beyond the likes of any other. 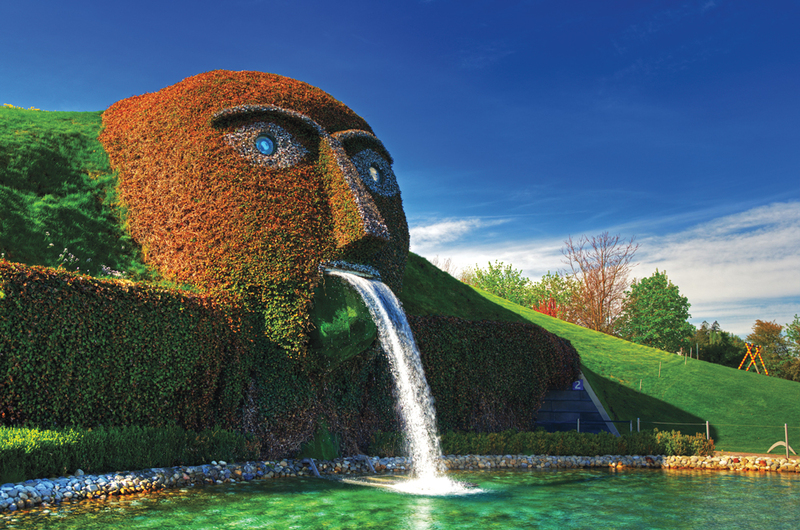 The newly revamped Swarovski Crystal Worlds is a remarkable installation in which the rooms themselves are the works of art brought to life by a variety of artists invited to convey the essence of Swarovski. The result is extraordinary. Swarovski Crystal Worlds immerses visitors in creativity and originality—an ultra-stylish chamber of arts and curiosities. It’s a department store of all things Swarovski, including not only the figurines and jewelry for which the brand is famous, but also precision instruments such as telescopes and binoculars. Austrian Airlines is the only airline to offer non-stop flights between JFK and Vienna, where a private VIP terminal welcomes with understated elegance in discreet surroundings. One of the most dramatic air routes in Europe, Austrian Airlines’ short hop from the capital to Innsbruck takes passengers over the Alps and down into the narrow Inn Valley, with mountains on both sides of the approach to the uncomplicated airport. Much like the city itself, the airport is intimate, situated in a beautiful location, thoroughly modern and very easy to enjoy.